These Air Fryer Boneless Pork Chops are nice and crispy with tons of Asian flavor. Have fun with the seasonings to create your own flavor combo or just follow the recipe as stated below. I find that the Air Fryer is perfect for cooking all kinds of meat, especially pork. If you haven’t tried my Air Fried Jamaican Jerk Pork Recipe, you should, it’s amazing! These air fried pork chops are just as amazing and about as easy to make in your air fryer. 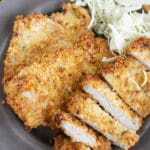 I made this recipe with a traditional Japanese pork tonkatsu recipe in mind. 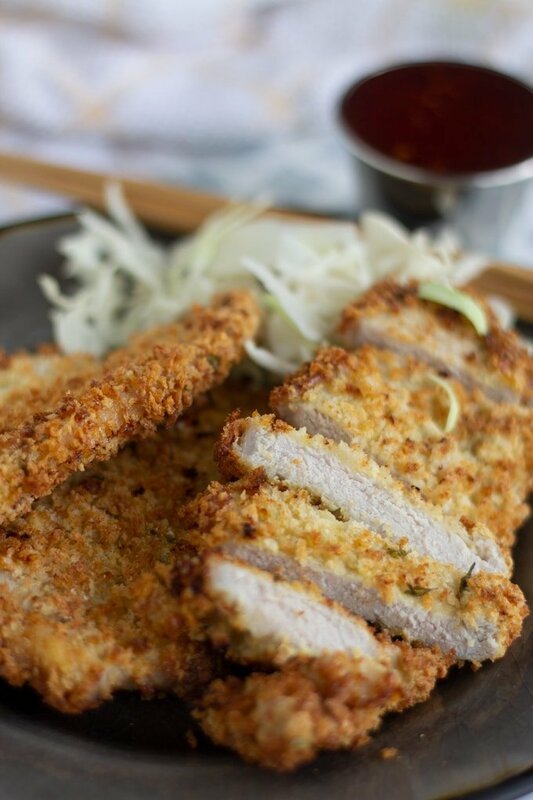 Japanese Tonkatsu is thinly sliced pork (cutlet or chops) that is breaded in flour, egg, and panko and fried to perfection. It’s generally served with a side of finely shredded cabbage and tonkatsu sauce. 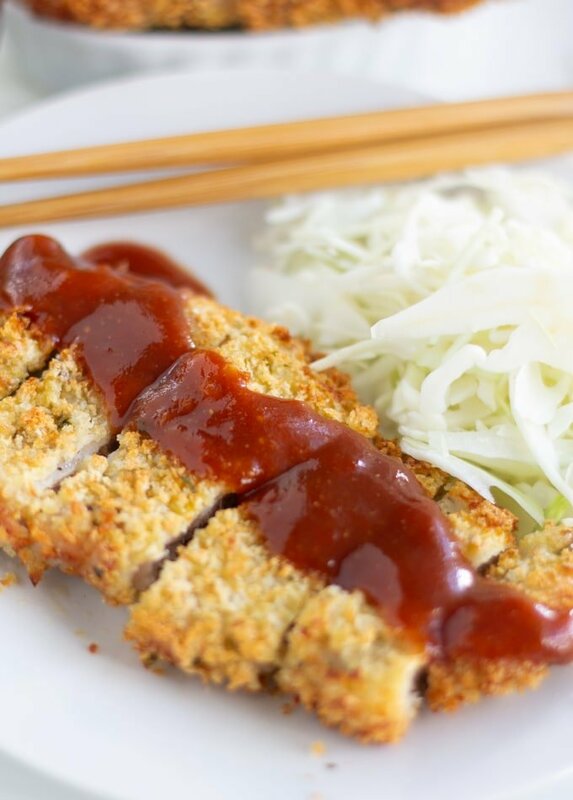 I usually skip the tonkatsu sauce and serve it with sweet chilli sauce. 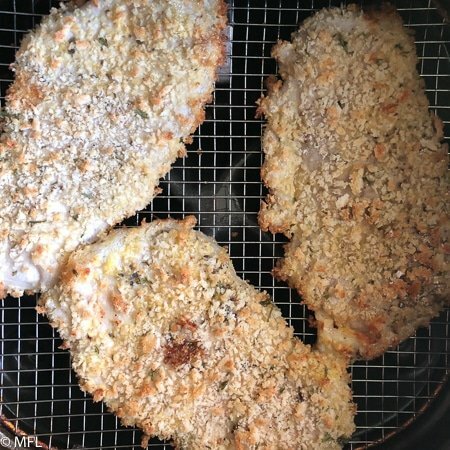 You can adapt this recipe and use any flavor breadcrumbs you like but I highly suggest using panko. I use seasoned Japanese panko breadcrumbs. 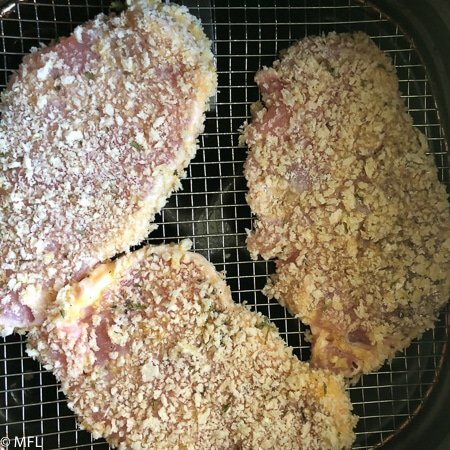 HOW TO MAKE AIR FRYER BONELESS PORK CHOPS? You’ll want to get a working station set up with flour, beaten eggs, and flavored panko breadcrumbs. 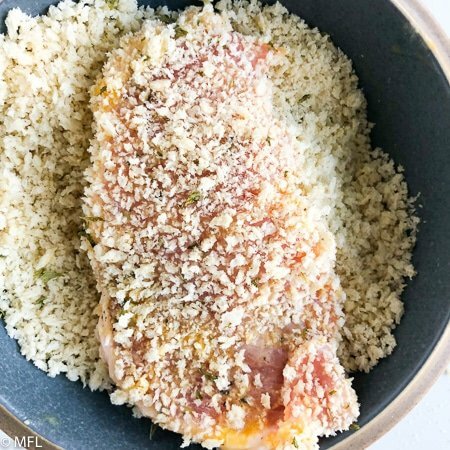 Make sure your pork chops are dry and coat both sides in the flour, then the egg, and the panko breadcrumbs. Place in your Air Fryer to cook. WHAT IS THE BEST TEMPERATURE TO COOK MY AIR FRYER BONELESS PORK CHOPS? For the best results, I recommend air frying the pork chops at 360 degrees Fahrenheit, rather than a higher heat. Cooking the pork chops at 360 allows the pork chops to get nice and crisp on the outside without drying out the meat. OIL OR NO OIL, THAT IS THE QUESTION? For this recipe, when using thinly sliced pork chops, I don’t spray the chops. I do spray the basket to avoid sticking as I don’t want to lose any breading when I flip. You may wonder what determines if meat needs to be sprayed or not. 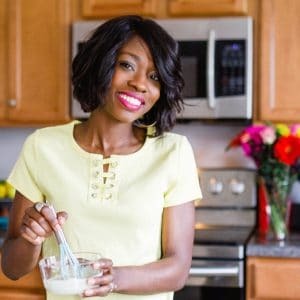 For the most part, it will depend on the type of breading, how long you cook, your Air fryer brand, and the amount of natural oils the food releases. I mention this briefly in my 10 Tips Every Air Fryer Owner Should Know post. These Air Fryer boneless pork chops are nice and crispy with tons of flavor and no added oil. Enjoy this delicious Asian inspired recipe without the added oil. Place flour, eggs, and panko breadcrumbs in separate shallow bowls. Set aside. Wash and pat pork chops dry. 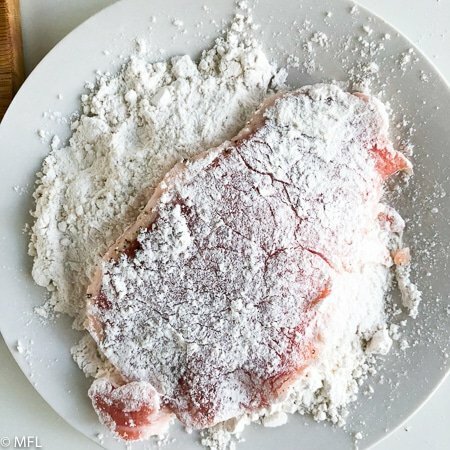 Sprinkle both sides of pork chops with salt and black pepper. 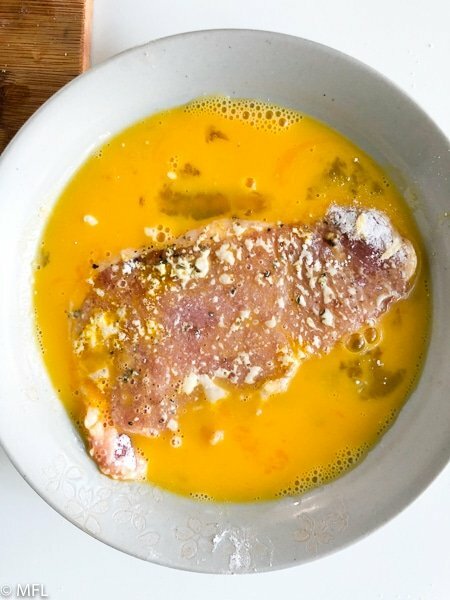 Take each pork chop and coat it in the flour, then the eggs, and then the panko. Place pork chops in Air Fryer basket, making sure there is no overlap. Set Air Fryer to 360 degrees Fahrenheit and cook for 8 minutes. Once 8 minutes is up, flip pork chops over and continue cooking for 5 more minutes. Remove and repeat for remaining pork chops. Serve pork chops with tonkatsu sauce or sweet chili sauce on the side. 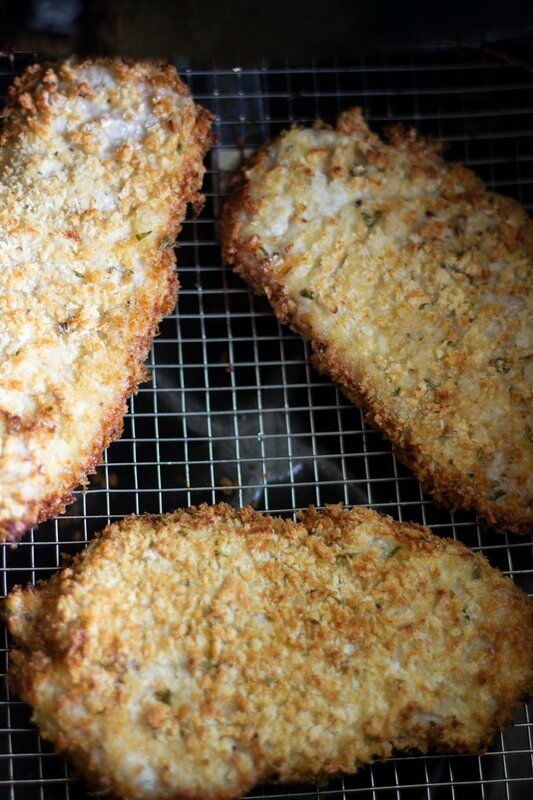 Feel free to change up the panko breading seasoning to suit your taste. This recipe was made in my Phillips Avance XL Air Fryer. Other brands may require a little longer of a cook time. Place pork in Air fryer. Cook at 360 degrees Fahrenheit for 8 minutes on one side. Flip and cook for 5 minutes more. Saw the boiled egg method on FB and it works a charm! Thought I could only do breaded etc. but have found so many other uses. Should have tried my pork steak last night but surely will next time. Have wanted an air fryer for ages and when I found a small one on sale last summer I caved in. And I really mean on sale…$29.99 at Target! (got a baby Keurig for my daughter also…such a bargain hunter!). Thanks for all these other ideas…meatloaf! who would a thunk? The only failure I had was chicken gizzards. I think I cooked them too hot for too long…totally my fault, not the fryer method. I’m so glad you like your Air Fryer. The possibilities are almost endless with this machine. I’ve never thought of chicken gizzard in the Air Fryer. I use them for my stuffing…so good. That looks really good! I think I need to get an air fryer ASAP!! I haven’t done pork chops in the air fryer yet! I can’t wait to try this! I have been dying to purchase an air fryer! These pork chops sound fantastic! I will definitely try this with my air fryer! I love how easy, healthy and delicious this is!! OMG! This is such a great idea for a weeknight dinner! I love how healthy this sounds!